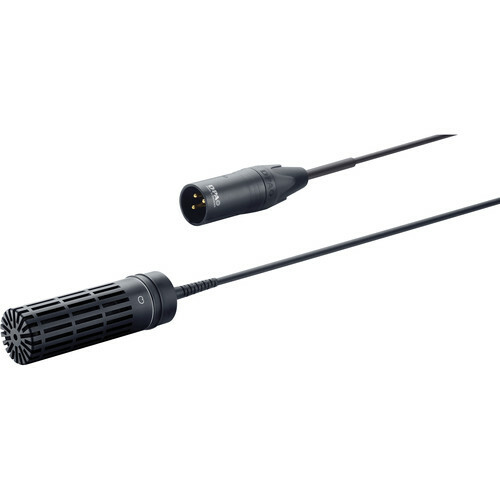 The 2011ER Cardioid Microphone, Active Rear Cable from DPA is designed for capturing audio and can be used in various environments, including theater, recording studios, broadcast TV, and similar applications. It features a cardioid directional pattern and a frequency range of 20 Hz to 20 kHz. The microphone contains an MMP-E active cable preamp, which splits amplification and phantom power duties. Additionally, the microphone offers a modular capsule with high-quality directivity control and radio frequency interference rejection. The 2011ER capsule is also suitable for capturing instruments in sound reinforcement applications. The capsule's twin diaphragm is designed to provide a fast impulse response and large frequency bandwidth, resulting in low inherent noise. The microphone's modular design allows users to manually switch optional capsules for enhanced versatility and performance. The preamp terminates with a 12mm attachment at one end and an XLR connector at the other. The 2011ER features a compact appearance and includes a SM4000-C Suspension Mount.